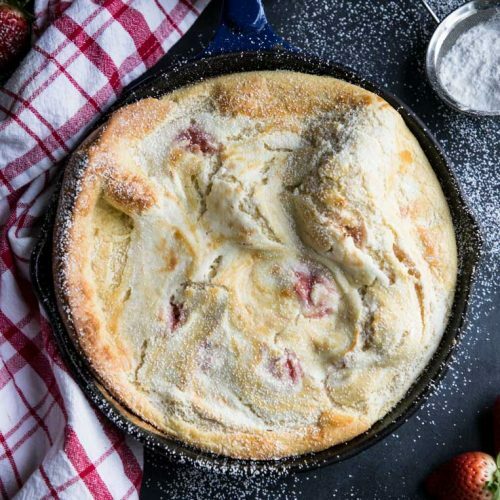 Dutch baby pancakes are amazing to bake, and even better to eat! Dig in to this sweet version with tangy strawberry jam and smooth cream cheese for an easy breakfast or simple brunch pleaser. Pancakes in a skillet take some babysitting to make. That’s why I love the ease of this dutch baby pancake–no babysitting required. No flipping, no keeping things warm while the rest of them cook. Yeah, I know it looks like something hard, but the beauty of it is that the eggs and heat from your oven create this amazing puff, complete with the prettiest peaks and valleys. And you don’t have to do anything but pour some batter in a hot skillet and close the door. 30 minutes later, you’re eating. Use a good quality strawberry jam with no colors or fillers. Fresh berries would release too much liquid in to your pancake and make it soggy. Remember also that once the jam cooks it may not retain its bright red color. That’s okay. That’s what real food does. Remember to only bake your dutch baby pancake in an oven safe skillet. That’s something like cast iron or stainless steel. Just make sure you don’t put any plastic handled trickery in your oven. The key to getting the puff is heat and eggs. Make sure you work really quickly once your skillet is hot. 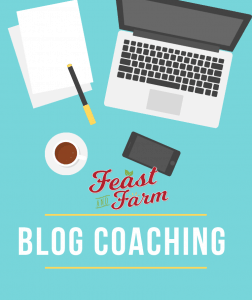 Don’t fiddle with that cream cheese. Just smack it in there and go. You should be able to add your batter and return that skillet to the oven in a minute or less. Feel free to add more jam or cream cheese to your dutch baby pancake if you want to. I didn’t want to over power mine and feel like the balance is good, but you can double those if you’re feeling wild. 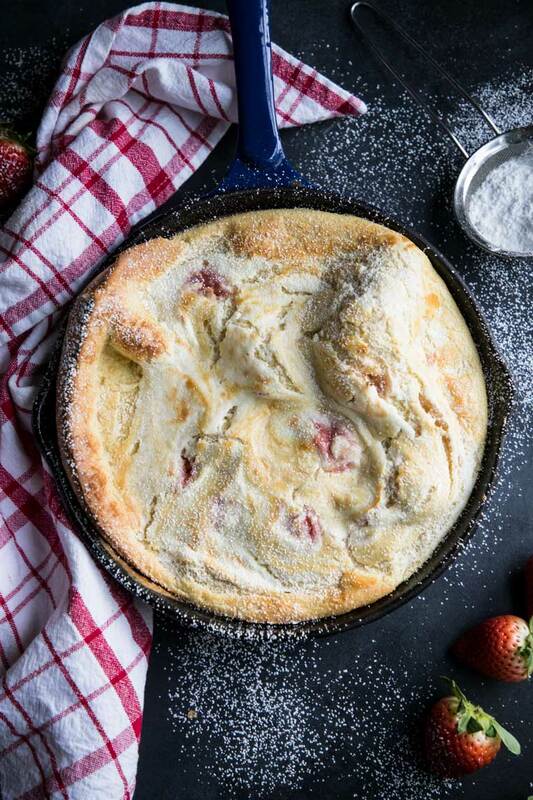 To make your dutch baby pancake, add batter to your hot skillet (top). Dot with cream cheese and strawberry jam (center) and quickly swirl with a knife (bottom) before returning to the oven. Serve your dutch baby pancake with filling baked ham and egg cups for extra protein. Or you might like to try a savory version. 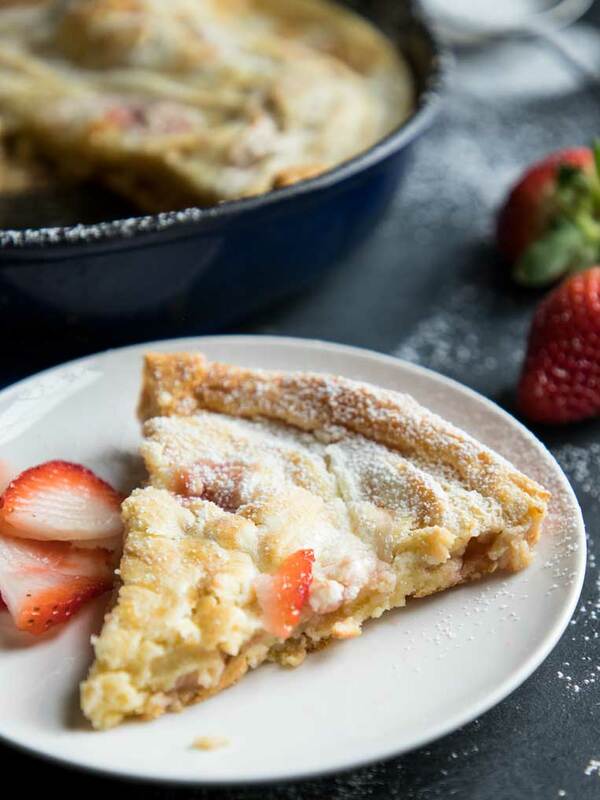 This dutch baby pancake is a sweet but easy breakfast treat that’s great for a special brunch, Valentine’s Day or any lazy morning. Just 30 minutes to bake! In a small bowl, beat the softened cream cheese, sugar, and vanilla until smooth. You should be able to do this with a fork if your cream cheese is very soft. No need to get a mixer out. Add the milk and stir to thin the cream cheese. You want it to be thin enough to spread with a knife into your batter when the time comes. If yours is too thick, add another tablespoon of milk until the mixture drops from your fork back into the bowl and doesn’t cling in a big clump. 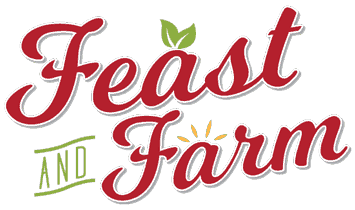 Set aside until ready to use, and make sure you have your strawberry jam ready to go as well. In a medium bowl, add the flour, salt and sugar and stir to combine. Set aside. In a glass measuring cup add the milk and microwave it until just warm–about 25 seconds or so. You don’t want it to boil, but you don’t want it ice cold from the fridge. Add the eggs to the milk and stir to combine. Add the vanilla and mix. Set aside. In a 9-inch ovenproof skillet, add the butter and place the skillet in to the oven to begin to heat, and let the butter melt–about 5 or 6 minutes. While the butter melts, pour the milk and egg mixture in to the flour mixture and stir to combine. Your batter will be lumpy at first, but mix well for about 30 seconds and they should clear up. Don’t beat it any longer than that or your pancake will be tough. Carefully remove the skillet from the oven and pour in your batter. Working quickly, dot the batter with the cream cheese and the jam and swirl to spread them around. Place the skillet back in the oven and bake until set–about 25 minutes. The pancake will rise dramatically in the oven and then fall as it cools. That’s normal. Serve warm with a sprinkle of powdered sugar or syrup if desired.